Economic data remain supportive and the inflation outlook is currently benign. 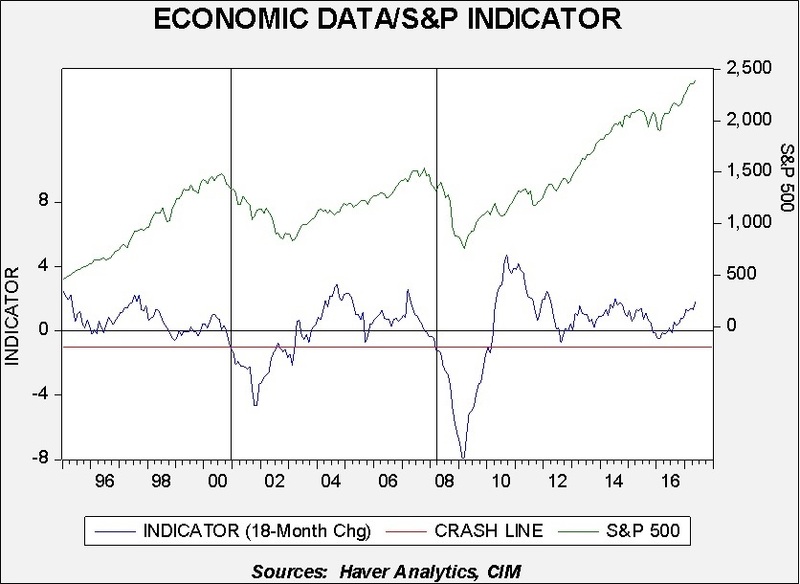 Though the economic expansion is elongated, we do not anticipate a near-term recession. Fed policy is expected to tighten in terms of rising short-term rates and the reduction in the size of the Fed’s balance sheet. We expect the Fed to commence the reduction of its $4.5 trillion balance sheet with a $10 billion monthly run-off by the end of this year. Expectations for a softer U.S. dollar combined with attractive valuations overseas have encouraged us to include non-U.S developed and emerging market equity exposure, the former with a tilt toward Europe. Overall allocations to bonds are intact, though with a heavier presence in intermediate-term bonds. Speculative grade bonds remain supportive for income objectives. Our growth/value even weight of 50/50 remains unchanged from last quarter. The themes present at the start of the year continue unabated, with inflation and unemployment at low levels and both consumer and business sentiment remaining elevated. 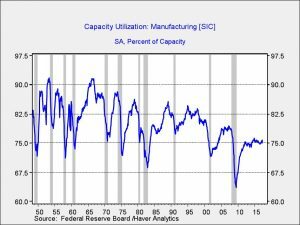 Although the U.S. is now 97 months into an expansion, closing in on the second longest on record, there are pockets of softness. 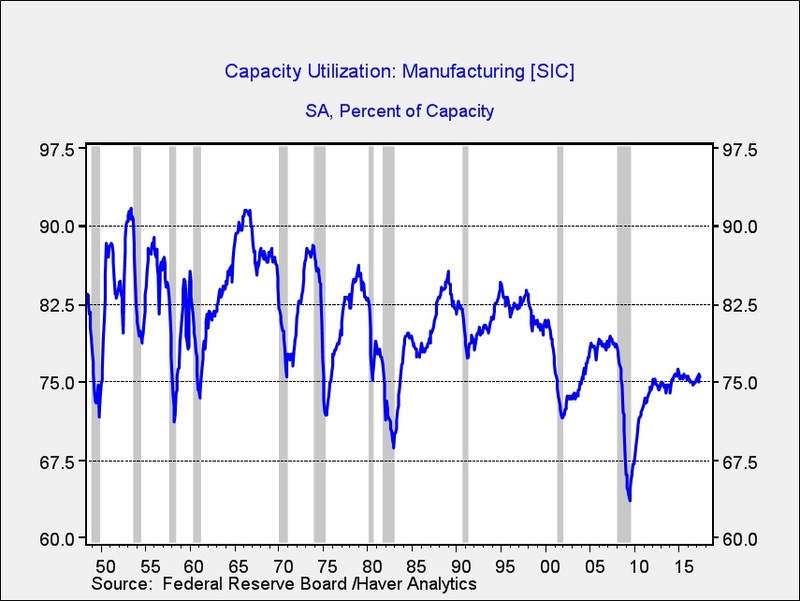 For example, consumption is slower than historical experience as measured by PCE, investment is muted and capacity utilization is running at 75%, as evidenced in the accompanying chart. In addition, government spending, inclusive of the contributions of states and municipalities, is very low as a percentage of real (inflation-adjusted) GDP. These measures all factor into our belief that a recession is not on the near-term horizon and the economy holds solid potential for continued expansion despite its current length. Although members of the FOMC are signaling further monetary tightening through an increase in the fed funds rate as well as a reduction in the reinvestment of balance sheet proceeds, markets anticipate that the Fed won’t be as hawkish as the current trajectory implies. 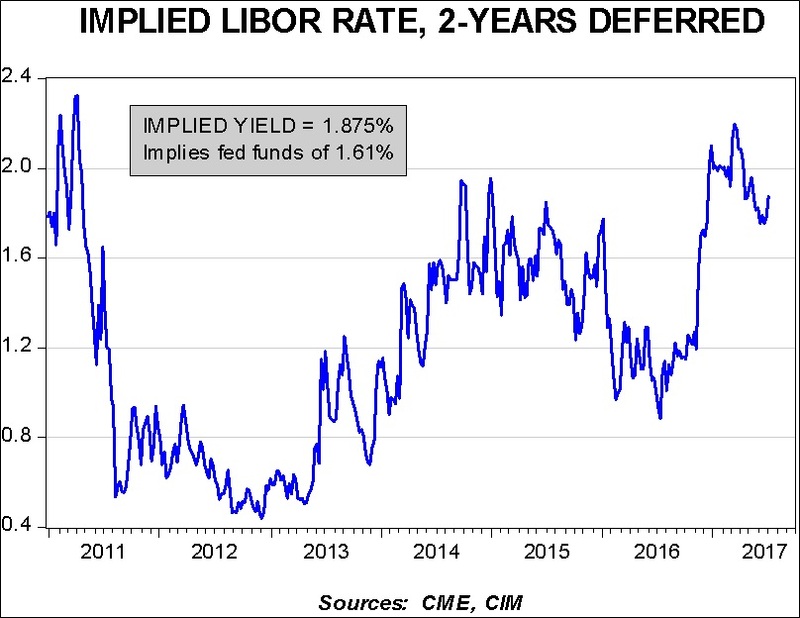 For example, the Fed’s much-publicized dot plots indicate a fed funds rate of 2.25% by this time next year, while the markets, as measured by LIBOR, provide an implied rate of 1.61%, as exhibited in the below chart. Our view is that the issues that create headlines, such as current Congressional activity surrounding healthcare and the potential modifications to the tax code, are more distracting than influential at this juncture. Until, or unless, legislation is advanced or the Fed missteps, we retain the perspective that equity markets carry fair value on the traditional metric of Price/Earnings with a benign level of inflation. In addition, the intermediate and long portions of the bond market provide positive inflation-adjusted returns. The greater near-term investment significance for U.S.-based investors include expectations that nascent U.S. dollar weakness relative to foreign currencies will continue, particularly versus the euro and the basket of emerging market currencies. The Trump administration’s encouragement of a weaker dollar is a marked departure from the policies of prior administrations and consistent with our belief that U.S. economic hegemony is waning. 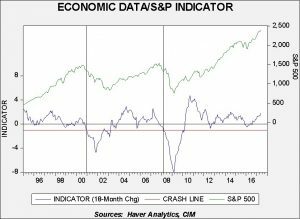 The economic landscape has proven favorable for U.S. equities and we find that the current economic environment remains healthy. However, signals of policy tightening from the Fed advise a degree of caution and bear continued scrutiny. In addition, recent readings of small business optimism exhibit softness compared to earlier in the year. Nevertheless, factors that are typical of elevated downside risk are noticeably absent, as shown on the accompanying chart. This graph depicts the monthly average for the S&P 500 Index versus our conflation of initial jobless claims, the Conference Board’s Consumer Confidence data and the CRB commodity index using adjusted standardized data.1 Though this shows that the U.S. economy is well advanced in the economic cycle, near-term concerns are not evident. Valuations have certainly advanced over the past year, but we believe that they can be persistent and are not untenable at this stage. Large cap, mid-cap and small cap equities have all enjoyed solid returns and traditional valuation metrics of Price/Earnings, Price/Book, and Price/Cash Flow have advanced accordingly. In contrast, non-U.S. equities, while enjoying positive returns this year, are generally priced below U.S. counterparts on traditional valuation metrics. Furthermore, given our views of a softer U.S. dollar environment, we are shifting some U.S. exposure to foreign equities. Much of this shift is being pulled from U.S. mid-cap exposure as pricing is more elevated and therefore expected returns are more muted. Among foreign domiciles, we tilt toward Europe in developed countries and also introduce exposure to emerging markets for more growth-oriented strategies. 1 For a full description of the standardization of data, please refer to our Asset Allocation Weekly, 6/30/17. Among U.S. large cap sectors, we favor healthcare and industrials and continue to underweight telecom and consumer staples. We reduce our previous overweight of financials and utilities to even-weight. REITs continue to be positioned in two strategies for their diversification benefits and potential for modest appreciation. Our growth/value style bias remains evenly balanced at 50/50, reflecting our views toward sectors and industries. The Treasury yield curve has flattened over the course of this year, reflecting tighter monetary conditions at the Fed. Though the duration of the bond exposure in the more income-oriented strategies remains consistent with our prior exposures, it is now attained through a greater allocation to the intermediate segment as opposed to the former bar-belled overweights to short- and long-term bonds. 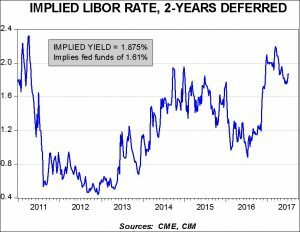 The exposure to long-term bonds has proven beneficial, but the current outlook has encouraged a more cautious positioning for the months ahead, especially as the Fed begins to engage in some normalization of its balance sheet. We maintain our favor to investment grade corporate bonds over Treasuries and mortgage-backed securities as the spreads continue to be attractive and supported. We also retain exposure to speculative grade bonds given our outlook for contained default and recovery rates. Despite a more favorable outlook for commodities, we have concluded that introducing exposure at this time may be premature. In an environment of faster economic growth and/or a surge in inflation expectations, commodities would prove helpful to a diversified portfolio. However, we harbor no expectations of either environment over the near term. Accordingly, there remain no allocations to commodities in the strategies.